You might say that most of the new language features (not to mention The Standard Library improvements) are there to write simpler/cleaner code. 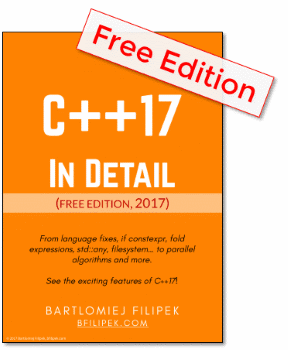 The “C++17 in details” series reviews most of the bigger things, still for today, I tried to pick a few features that make your code more compact right off the bat. If not, then you should probably start looking into it. Not only are tuples suggested for returning multiple values from a function, but they've also got special language support - so that the code is even easier and cleaner. Look, that val has a separate scope, without that it ‘leaks’ to enclosing scope. With Non-Static Data Member Initialization (see my post about it here), we can now declare and initialize member variables in one place. Still, with static variables (or const static) you usually need to define it in some cpp file. C++11 and constexpr keyword allow you to declare and define static variables in one place, but it’s limited to constexpr’essions only. I’ve even asked the question: c++ - What’s the difference between static constexpr and static inline variables in C++17? - Stack Overflow - to make it a bit clear. Ok, but what’s the deal with this feature? Previously only methods/functions could be specified as inline, but now you can do the same with variables, inside a header file. A variable declared inline has the same semantics as a function declared inline: it can be defined, identically, in multiple translation units, must be defined in every translation unit in which it is used, and the behavior of the program is as if there was exactly one variable. I’ve already introduced this feature in my previous post about templates: templates/constexpr-if. It was only a brief description, so now we can think about examples that shed a bit more light on the feature. So, in most of the cases, we can now just write a constexpr if statement and that will yield much cleaner code. This is especially important for metaprogramming/template code that is, I think, complex by its nature. In the C++Now 2017: Bryce Lelbach “C++17 Features”/16th minute there’s a nice example, where constexpr if can be used to define get<N> function - that could work for structured bindings. As you can see it’s questionable which is the simpler code here. Although in this case, we’ve used only a simple struct, with some real world examples the final code would be much more complex and thus constexpr if would be cleaner. C++17: let’s have a look at the constexpr if – FJ - I’ve taken the idea of fibonacci example from there. We can argue that most of the new features of C++ simplify the language in one way or another. In this post, I focused on the bigger parts, also without doing much repetition. One of the best things is constexpr if that allows you to write template/metaprogramming code in a similar way to standard code. For me, it’s a huge benefit (as I am always frightened of those scary template tricks).